The productivity and the tool life of cutting tools are majorly influenced by the cutting edge micro shape. The identification of optimized cutting edges is usually based on empirical knowledge or is carried out in iterative investigation steps. This paper presents an approach to predict optimal cutting edge micro shapes with the aid of finite-element-simulations of the chip formation. The approach is investigated for the machining of the nickel-base alloy Inconel 718. The cutting edges are prepared by pressurized air wet abrasive jet machining. Utilizing this method, the prepared cutting edges have a certain profile, which is considered for the modelling. By applying a model for tool wear the influence of the cutting edge micro shape on the tool life span is estimated. Subsequently, a statistical modelling provides the prediction of the tool wear rate for any possible parameter set within the investigated range. This is used to find an optimized cutting edge profile that minimizes the tool wear. An experimental investigation concludes the optimization procedure. 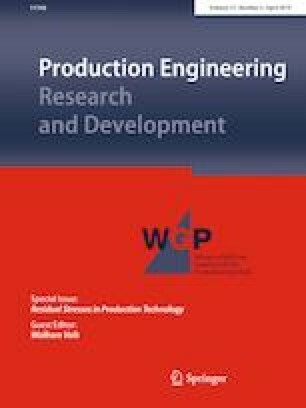 This paper is based on investigations of the projects “Development of a simulation based method for a load dependent optimization of cemented carbide tools for nickel-base alloys—Variable micro geometry along the cutting edge/Knowledge Transfer Project” (BI 498/75)—project number 313918187 and “Analysis of a simulation approach to model the material removal when preparing cutting edge with wet abrasive jet machining” (BI 498/89)—project number 374073886 which are kindly supported by the German Research Foundation (DFG).